In a departure from tradition, this week’s blog will focus on what we don’t know about a specimen, rather than what we do know. The reason being is that the specimen in question is rather mysterious. All of the usual pieces of information which can help identify a specimen are lacking – no number, no entry in the accession records, no associated documentation and no taxonomic information. What you see is what you get with this specimen. 36 individual wax models. No stands. On (later) purpose-cut serving slabs (there are small recesses cut into the glass to ‘seat’ each model). They are individually numbered from 1-36 in black ink (sequence starting from top left, moving down each slab from top to bottom in above image). Skillfully made. Developmental embryological series of unknown taxonomy. Recently ordered according to their numbering, it became clearer that these models were an individual series rather than several smaller series or a random assortment of individual embryos. But are they embryos at all? 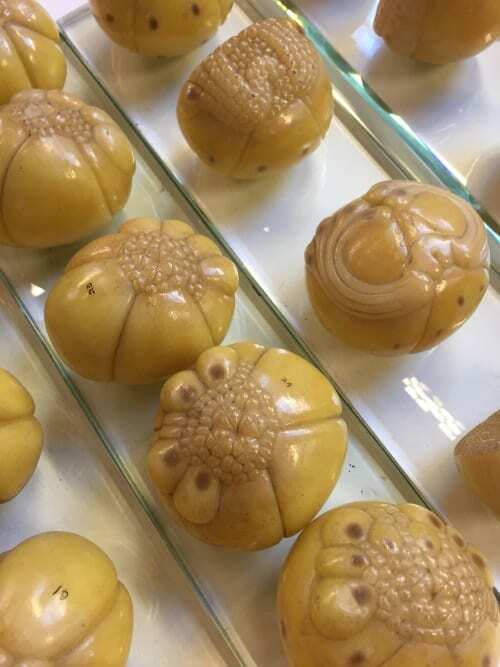 They do resemble other embryological series which detail the advancing stages of development from zygote to multi-nucleated cell – and the Grant Museum has several such sets of wax models in the collection from which we may compare the mystery set. However, there is nothing in the collection quite like these models so we can confirm that this set is not a series showing the development of humans, chickens, trout, frog, amphioxus, crayfish, echinoderms or parasitic worms. The answer to this question may be linked to the taxonomic identification. 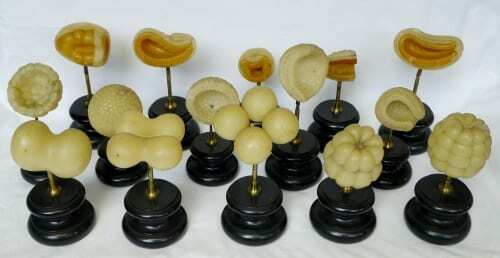 Makers 19th century embryological wax models such as Adolf and Friedrich Ziegler, Rudolf Weisker, Paul Loth and Paul Osterloh often produced catalogues, prospectuses and price lists of their models which detailed the names and numbers of models/series and the dates they were produced. Information in the catalogues, (as well as receipts for purchases of wax models which may exist in museum archives) can therefore be utilised to determine the maker and taxonomy. 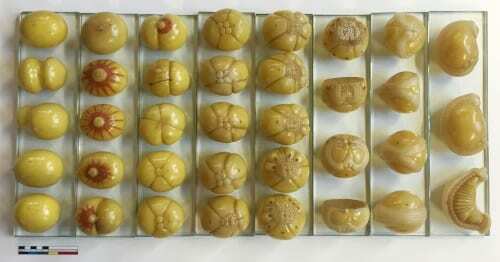 During the recent inventory and identification of the other 219 individual wax models in the Grant Museum, catalogue cross-referencing was widely used to determine identities, maker, production dates and date of entry into the museum. But not so for the mystery models. They do not appear on the Ziegler Studio catalogue lists (nor match the descriptions). Stylistically these models look more Weisker-like than other wax makers (colour, size, overall quality) but do not match up taxonomically to existing, often incomplete lists 1. -where and when were the models made? -when and how did they enter the Grant Museum? -is there evidence they were used in teaching at the Grant Museum? -were they made as teaching aides? -are they rare or even one-of-a-kind? -is it a complete set? -are they important as ‘natural artefacts’ or artificed objects? -what is their value? Valued by whom? Answering these questions will help place these models in the wider contexts of the history of science, embryological research and use of models in academic teaching. We will keep you updated on the student’s progress and and look forward to their results!